In tonights short coding session I added two new components. A tagging system for entities. Unity already has a way to add a tag to gameObjects, but for me “tagging” means being able to add several tags to an object, which Unity does not support. Something can be tagged both as NPC AND a Human. Second, I added a new (very simple) AI-component that will rush towards player or NPC if standing in front of it. It utilises the tagging system to get a list of all entities tagged as either “player” or “NPC”, check direction and distance, and start charging! As you can see, the Hedgehog speeds up if either NPC_Joey or the player is in front of it (although the graphics does not flip correctly yet). A while back my friend Steve asked me if he could use my old platformer engine for a game he wanted to do! I was very happy to see it come to use! The engine is open source btw, and can be found here: https://github.com/Tommislav/unity2dPhysics. 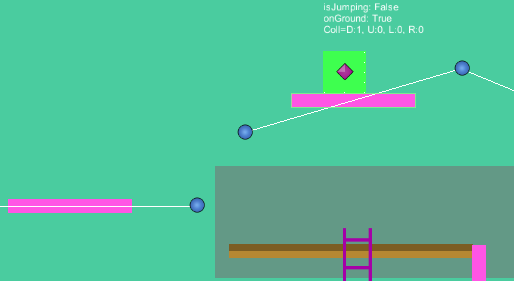 But tonights short coding session involved a fix to the physics system to detect when someone is “over a ledge”. The hedgehog enemy in the image above will switch patrol direction if either hitting a wall, or getting over a ledge. The guy with the white hat is my old AI, who just moves in random directions for a random amount of time. In my last post he was a red box. Steve has drawn and animated him quite nice! Started on wall jumping feature (based on public demand), this is not all done yet though! Moving the project over to Unity 5 went pretty painless, unless the collider offsets were messed up on my platforms, meaning I had to adjust all of them. Luckily the level isn’t that big, which meant it only took a few minutes. If I had turned the platforms into prefabs (which would have been the right thing to do) this operation would only have taken a few seconds. And I’ve been playing with the though of adding some background particles. I wanted some slow/smooth/subtle background noise. Well… I don’t know what to think of it. I could have spent the entire night tweaking it. But instead I moved on to the wall jumping part. I have to say I’m very satisfied with the gliding part (just need to add some particles while slowly sliding down the wall), but the actual jumping-part is horrible. But that’s something I’ll have to fix another nigth. Now it’s time for bed. 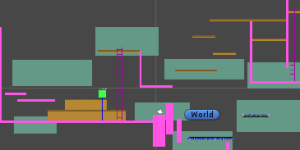 Today, with the platforms finally fixed, I started expanding the level. 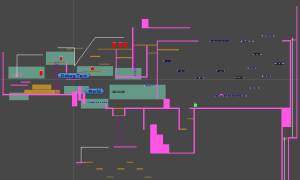 I’m not sure how Unity optimizes what goes on behind the scenes, so the only way to figure out is to try it out. Also, it’s a good way to find out what features I feel like I’m missing. Like pick-ups, or enemies that or obstacles that will hurt you. It also gives me some room to really try out the features I already got. Like the treadmills for example. I haven’t been coding much (on my game, that is) for the past two months. Instead I’ve spent a lot of time watching the Handmade Hero stream. It’s really fascinating and I highly recommend it, but I’ve been having some code cravings lately. So I decided to go back to my platform engine again. Last time I coded on it I left it in a rather poor condition, with some buggy moving platforms. 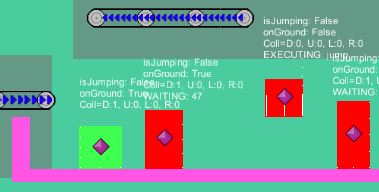 The problem is that the Character2dController reports to the platform that it has collided with it, and the platform keeps track of the colliding entity and reports back its change in movement to the Character2dController. But the platform only held a single instance of the colliding object, meaning it messed up if more than one entity intersected it. The problem was solved as easy as changing the variable to a list. Something that is very useful when debugging this kind of graphical application (with several entities with different state and values) is to be able to easily read state data. For this I’ve added debug output above each Character. 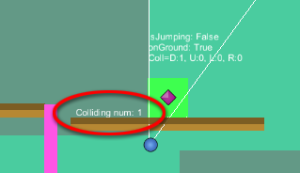 This debug is a stand alone component, so I could easily add it to the moving platform as well, to verify that the list of colliding GameObjects counts up and down as expected. Apart from this bug fix there’s no new features, so I don’t provide a new build today. 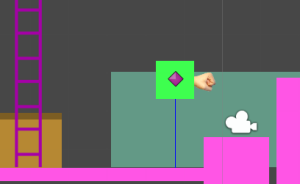 First of all, a disclaimer: I have decided to change the name from physics to platform engine from this point. Not sure how much more physics I will implement right now. I think from now on it’s time to focus more on trying to make this into something playable. 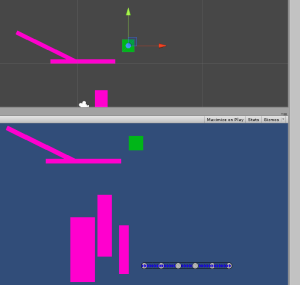 Finally the work started to pay off with decoupled physics. The input is also decoupled, meaning that I could just duplicate the player logic, remove the input script and attach a simple AI controller instead. Now we have a whole bunch of red NPC:s running and jumping around. I think next step might be to build a larger world to be able to see if performance is doing ok in a larger setting. Otherwise I think that it’s time to start looking into graphics and animations. Been some while since I last wrote now. Been doing some other stuff than Unity (some c++, and some updates to Ripple and its level editor). But now it’s time to get back to this little project again. 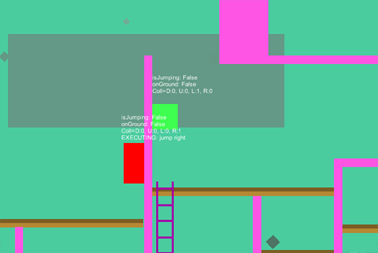 Something that bothered me a lot in the past was how fast it gets messy when implementing platform mechanics. You need need to keep track of if you are jumping, falling, standing on ground, climbing, ducking, sliding, hurting, attacking. And these states gets intertwined into each other. For example: what is a valid state for a charater to jump? He should be standing on the ground – unless if he’s climbing a ladder… or if he’s hurt or dead. And if the player pressed the jump button and the character lands on the ground without releasing the button then we shouldn’t automatically jump again until the button is released and pressed again. My very small piece of code had already started to get messy this early on, so for a few days I’ve been refactoring it into smaller, more independant and stand-alone modules. This new version is completely rewritten, and all the previous functionality has been ported. Along with a lot of bugfixes. Been working a bit here and there on tweaking the scripts to the way I prefer them. Not really getting any visual progress, more just shuffling code around.